CAMPBELL, CA--(Marketwire - October 21, 2010) - Market research firm Infonetics Research (http://twitter.com/infonetics) today released excerpts from its updated 2010 Security Client Software market size and forecast report. "The most interesting news in the mobile client security market right now is the heavy industry consolidation going on. Juniper acquired SMobile and is diving headfirst into the enterprise mobile security market; McAfee picked up two enterprise-focused mobile security companies: Trust Digital and tenCube; and Symantec picked up GuardianEdge. Consolidation will help drive strong growth in the mobile client security software market as larger vendors can put real marketing muscle behind the technology that they've acquired," notes Jeff Wilson, principal analyst for security at Infonetics Research. 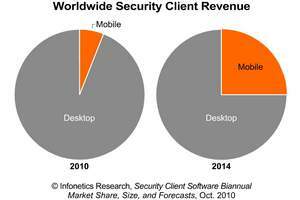 Infonetics' Security Client Software report provides regional and worldwide market size, select market share, forecasts through 2014, and analysis for security client software for consumer and enterprise desktops/laptops, and for mobile security clients, including data protection clients for smartphones and anti-x clients for data in motion. The report provides market share for Kaspersky, McAfee, Symantec, and Trend Micro, and tracks client software made by AhnLab, Avast!, Avira, BitDefender, Bluefire, Bullguard, Check Point/ZoneAlarm, Credant, Dr. Web, F-Secure, GuardianEdge, Juniper/SMobile, Kaspersky, McAfee, Mobile Armor, Panda, Sophos, Symantec, Trend Micro, and others.